Ahhhh... the season we have all been waiting for is here. The bigger winter swells are starting to pound the West Coast shorelines and the breaks that have been sitting calm are starting to come alive. In past years the number of West Coast Canadian surfers has been quite small, but I think the 2009-2010 winter will show the new realm of surfing in Canada. The numbers are growing rapidly and it is not just the crowds in the summer anymore. This article is not intended to discourage anyone but to help introduce the beginners to this wonderful sport and help them to understand what winter surfing is all about. Surfing is not like most sports. Surfing can put you into situations that are way over your head very easily. You may not only jeopardise your own safety but the safety of others in the water as well. For the beginner surfer, larger waves are not what you are looking for. Large waves will not make your surf improve; riding the smaller, summer waves does not mean that you are ready for a six foot point or reef break. Bigger surf means more duck diving, more paddling, increased wave knowledge and the ability to understand how proper etiquette in the water must work. The person that is closest to the peak in the in the position to take the wave. The peak is the biggest and steepest part of the wave and this is where you take off and drop in. It takes some time to overcome the fear, so in turn you try and drop in further down the wave (shoulder hopping). This is where you end up dropping in on the guy who just made it from the peak and causing an accident- and we all know that the bigger the wave, the more it hurts. The line up at the peak is so important to understand and we use this system for a reason. Another important point is not to paddle right to the peak when you enter the water, unless of course you are the first one in. We've seen lots of people paddling right to the peak and catching the first wave that they see. Remember... there are other peps in the water that have been waiting for the sets, freezing their butts off, before you paddled out. Wait your turn and everyone will have a better session. If you are new to the sport of surfing -- ask questions. Most people are willing to share their knowledge and if they aren't, you know why they are tainted. So before entering the water on the next big swell... make sure you are competent enough with your surfing ability to put yourself into the situations that lie ahead. If you're not -- move down the beach and practice a little more so when the next swell hits, you're not the guy getting the stink eye in the line up. 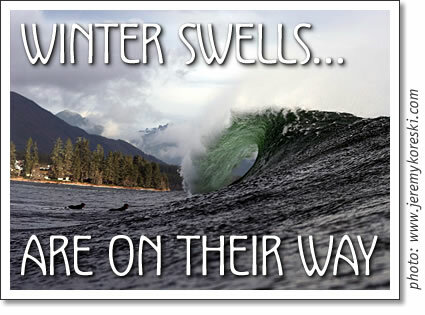 Tofino surfing in the winter: the arrival of larger winter swells is greatly anticipated by Tofino surfers. Published in the November 2009 issue of Tofino Time Magazine.